UPDATE: Small, sleek, and simple to use – the new Media Remote for PlayStation 4 is hitting store shelves today. The remote’s compact design and improved ergonomics offer intuitive navigation and control for your favorite movies and TV shows on PS4. It also comes with dedicated PS4 buttons, allowing you to easily navigate through system menus and apps. Click here for details and purchasing options. If you’re looking for a remote with extra features and the ability to control devices in addition to your PS4, read on for details on the Universal Media Remote for PS4. We all love DualShock 4, but sometimes when you’re watching movies, you just want a remote. The good news is now you can, since we’ve worked closely with Performance Designed Products (PDP) on a Universal Media Remote for PlayStation 4 that will let you turn on the system, navigate the UI, and control video content on apps like Netflix or on Blu-rays and DVDs. The Universal Media Remote for PS4, which will be available in the U.S., Canada and Mexico when it launches later this month, uses Bluetooth to control PS4 and can also be set up to control up to three additional devices, including a TV, cable box and audio receiver. It also features many of the most important buttons for navigating system menus and entertainment apps on PS4 including the Action buttons (triangle, circle, cross, and square). Like DualShock 4, the remote also features the SHARE, OPTIONS, and PS buttons. Pick up the Universal Media Remote for PS4 when it releases later this month for $29.99 (MSRP) or pre-order it now. finally, it’s great to have a dedicated remote for PS4. I hate using the DS4 because it drains the battery, or you have to manually shut off the DS4 power over and over again and it’s annoying to inadvertently hit the should buttons and have the Blu-ray or other media skip around. Well, good for those who love movie, but I didn’t bought ps4 to watch a movie. I didn’t care for the ps3 remote, and this looks like they pretty much copied it over to the ps4. I mean, it works fine and all, but I hope the remote has more support for devices, I believe the ps3 remote only worked with Sony receivers. Also, no backlighting, still? This is why you guys need IR support, the ps4 cant really be a home theater hub without a proper universal, which this remote isnt, and it has no support for 3rd party universal remotes. And don’t give me that nonsense about it being primarily a game system, it’s promoted as a media hub device and will have a long life in many systems as such a device, but this is an area the ps4 lags behind the competitors, why allow this when you could offer IR support and just crush the competition in every category? All you need is to authorize a properly licensed device to implement an IR dongle. Hallelujah, prayers gave been answered! This has been a long time coming. Super excited for this, but why isn’t there a subtitle button? I used that button a lot on the PS3 remote. Man you’re right there is no Subtitle button. That’s gonna be a problem for me too. Great for those just getting a PS4, but I ditched the PS4 as a multimedia device a month after getting it in 2013. Great gaming console, but without a quality remote, I had to look for another multimedia device. 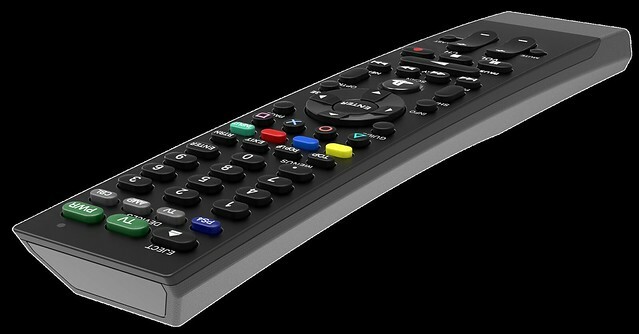 I wish they would make a full featured universal remote to compete with my Harmony One, I’d buy that in a second. I’ve been waiting for this for a long time. Though I’m hoping that list of apps grows quickly to also include Amazon Video and Hulu. I really love my remote for the PS3, but oddly I love the original more than redesigned one. The original had the PLAY, PAUSE and STOP buttons prominently displayed, and they were very large. That made it easier to use at night, in the dark. Hi, NFL Sunday Ticket is already supported. Support for many other Apps will be available soon. Glad Funimation and Netflix are supported right away. I may need this for family members. And also, the light on the controller is annoying as all hell when watching something in the dark. Just realized, Sony wants to force us to buy this by not allowing us to turn off the light on the DS4 controller. Nice try Sony. I think I’ll hold off now. All you have to do is turn off the controller…… or set it to turn off after 10 minutes…. problem solved and battery life saved a little but not much. The Harmony Hub supports it, but not well, in my opinion. I constantly have to reset the hub and re-sync the bluetooth connection (like once a week). I believe it’s due to an issue with the hub’s bluetooth signal degrading over time, but only because I don’t have issues with other bluetooth devices disconnecting from the PS4. Hopefully, Logitech will be able to figure out their issues soon. Yea unfortionately Sony hasn’t made full Bluetooth controls available to other manufacturers. My Harmony Home Hub is essentially acting as a Bluetooth keyboard. It works perfectly for putting the system into Rest Mode when shutting the activity down, but navigation and play controls in DVDs as well as powering the PS4 on do not work. Hopefully Sony will through 3rd party universal remotes a bone. As far as connectivity issues like the other commenter said, I’ve had no problems. Just make sure you turn the PS4 on right before selecting your PS4 activity. Will the bluetooth stack be made available to the likes of the Harmony Hub based remotes?? Thank, you! Granted I said this at the announcement, but I’m really happy to finally be getting this. However as a long time PlayStation customer who tends to early adopt and have been doing so since the PS2 (every system since), I would ask that you consider releasing a remote at launch for PS5 instead of waiting almost 2 years. I’ve been using my PS3 with its remote and switching between devices when I already have one on is not ideal. Only thing I wished this could do is turn on PS3 on and operate it just as well as my PS4. I’m ok with the exclusion. Please thank the vendors and sony’s internal teams for getting these apps ready for use with the remote (even if there was little to no work at all), just having these applications has been a nice rounding off of features. Question though. Can the media remote be used on the Media player while playing a game? So i can say skip tracks on my play list or what have you without leaving to go to the Short Cut Menu? If not a feature update would be appreciated down the road. perrandy, your response is neither here nor there. I will be enjoying my PS4 for the next 3 to 4 years. I’d like Sony to take note over that interval since PS5 development has already begun. I’m not requesting a PS5 be released tomorrow, I’m saying sony should be mindful of tomorrow while we address problem of today. I got my PS2 with a DVD remote that controlled all my media that I used with it. I got my PS3 with a Bluetooth Bluray remote for the same reasons. I got my PS4 and suddenly I had to wait 2 years and found myself using my PS3 an extra 2 years for something my PS4 should have been able to do at launch. Lack of a remote at launch was not the right call. the ps3 did not have a remote at launch i’m pretty sure….., I have a launch system that YOLDed 3 times and is now dead for good…… nor did the ps2…. if you wait 2 years to buy the system, then you won’t have to wait to get the remote ;), but I do agree, it seems like they could get them out sooner…..
Not Hulu? That ain’t cool but still going get it. Also annoyed by this as the circle button does not work. So you can get into a show and pause, ffd,rwd,play; however cannot go back. Unless someone else has it worjibg, if so would love to know how. Am hoping hulu will support it soon. $30 or continue to have a giant blue spot light on when watching a movie while it’s simultaneously draining a battery that is too small. Sold. Or you could change the controller settings. Care to share your wisdom with us? You can lower the brightness of the DS4’s light. However, most are still not satisfied with that setting. I definitely am. I am a big plex user please tell me if plex is one of those app gonna be announced at a later date. I probably sound like a broken record, but please one up the API for my Harmony One remote to be able to turn on/off the PS4. I shouldn’t need a second remote to do that. What do you want them to copy the X1 remote? Backlights are overrated anyway. Serioualy, it’s not a legitimate home theater remote without backlighting. I love my WR7, really had the best backlighting implementation I’ve seen and makes a huge difference when watching a movie. Xone has IR support so I’m still able to use it thanks to the learning function, which is why I can’t use my ps4 or ps3 as my living room console. Either they should release a proper universal remote with backlighting, or allow an authorized IR adapter to be made (instead of waiting for wonky 3rd party poorly implemented dongles to be made). I’ve actually had mine preordered since July. I’m really excited about this (probably way more than I should be). Less than a month until I finally get my hands on it. Mine has been on preorder on Amazon since June! So excited!!!!! will this remote be compatible with USB music player, especially during gameplay ss BGM? Why not crackle and chill? Hey lets put the eject button on the top left corner, the most likeliest location for it to be accidentally hit (Sarcasm). Did you guys not learn from the PS3 media remote? What button would you want there? And what about people that put their remote on their left? How about don’t sit on it? $30 – Hahaha. You guys are funny. $30 isn’t that bad. I was expecting it to be $59.99 or $64.99 for a colored one. Definitely a purchase for me. I hope it works on NHL gamecenter live as well. So, I suppose this is a dumb question: Do I need a bluetooth-capable TV in order for this remote to control my TV power and volume, or does the remote also have an infrared relay? Also, would I be able to program it to control other infrared receiver things? I don’t have an audio receiver, but I do have an HDMI switcher that I’d love to be able to control. I know, I know… pipe dreams. Has an IR blaster installed as well as Bluetooth. It works with TV using Infrared. Additionally, it works with an Audio receiver and Cable box using Infrared as well. Might be nice if it could control music (Spotify). I love Spotify so much on PS4. It’s about time!!! I really do hope the apps list grows quickly. My wife will love that. Now… Get that UFC app out please! So glad they are coming out with this. As a father of a two year old that loves to chew on ds4’s i’ll be happy to get a remote i can pocket. Is the remote programmable? I want the ability to start PS Vue with one button without all the scrolling and navigating just like the Roku does for Netflix, Sling, etc. It uses Bluetooth but is there still a USB dongle you have to plug in? When this launches will the PS4 start properly supporting other universal remotes like Harmony, including allowing us to turn on the console with it? Sony has no IR receiver. Without that, you’re out of luck. Hopefully soon, since all newer Logitech Harmony products have Bluetooth and I can at least shutdown the PS4 with it. Please add support for the existing PS3 bluray remote. No headphone jack:( I thought this would be added since it is on dual shock 4 and roku has it. It makes a big difference. So now if I want to watch a movie with headphones and use a remote I have to be plugged into my DS4 and control it with this universal remote? I will not be purchasing. Everyone has a smart TV now with apps that support 4K content (Netflix & Amazon) so I use my tv for stream viewing because PS4 does not support 4K. C’mon Sony lets get with the times. There is nothing revolutionary or forward thinking about this device. P.S. hire me I have great ideas. Uh what? Not everyone has a 4k TV. Those are a huge waste of money, many people are fine with 1080p. Finally. PS4 should have launched with one of these. I will gladly add it to my PS4 collection, just please try to have a media remote ready for launch whenever PS5 rolls around. Will this be compatible with the 24″ PlayStation branded 3DTV from 2011? I hope it’s fully compatible with Sony’s XBR-X900B TV. How about a bluetooth chat headset? I hope whatever software update is released with this improves functionality with my Harmony remote. Power off works but no power on. Neflix, but no Crunchyroll. I picked one up today at a local Gamestop. Had a bunch of them. I thought it was Kinda Funny that Amazon shows a date of the 27th. I just picked up mines, too, Saturday. But apparently there must be helluva lot people in area that also must have found out GS has it out now b/c none of the GS in my town had anymore! I had pick up mines from GS in the neighboring town (luckily it wasn’t too far out of the way from where I live & I got a car). There’s an Input button right above Square, it’s just a bit hard to read the white on green in the image. Finally some good news from Sony. #1. Universal media remote. This was must have device for my PS3 and it took long enough. I have no idea why Sony waited so long because many people wanted it. #2. The Uncharted Collection PS4 bundle for $349.99. It took 2 years but we finally see a price drop. I know they added games before to make some deals but this is finally a “price drop”. I can’t wait to see what kind of black friday deals will come. Maybe add 1 or even 2 extra games on top of the Uncharted Collection PS4 bundle? *There is a Militrary Appreciation PS4 bundle with 500GB PS4, 2 controllers (black and camo), NBA 2K15, The Last of Us for $399.99 right now at GameStop. Not too shabby. What is next? Please fix PSN and bring out the awesome deals that were in the past. Not these terrible overpriced “deals”. Will it work with my Roku? Would love one remote for everything. What is this? Is this sarcasm I can’t tell? Because I have been looking for one of these actually. I think this is great for anyone that needs it, but I found that I’m able to use the remote that came with my Sony TV. It’s called Bravia sync and all you need to do is have HDMI Device Link enabled on the PS4. I’m able to control the PS4 menu and apps all from my Sony TV remote. Not everyone owns a Sony TV. I went Vizio for most of my TV’s in my home and none of them have this feature. I am familiar with it though and it is nice. However I’d like to have this remote myself. You don’t have to have a Sony TV to use the HDMI device link. I have an Insignia from Best Buy and after changing a few settings I can control my PS4 with my TV’s existing remote. Granted it doesn’t have a PS button but it’s cool when I’m watching TV and switch the input and it turns on my PS4 or when I power on my PS4 by pressing the PS button on my DS4 and my TV comes on also. Check your TV only one of my HDMI ports allows the device link but if yours does it might be worth taking advantage of basically a free remote by changing a few settings. Something to check though is one of the options on my TV was to turn off the connected device when the TV’s turned off I didn’t turn this on in case it just shuts down the PS4 while I’ve got a game going if I turn off my TV. While I can’t get the remote to navigate YouTube it works great with Netflix while my remote doesn’t have the PS button I can use the exit button to go back to the home screen or use the PS4 voice controls. Hope this helps. Actually the Ability to Turn On the PS4 by selecting the HDMI port from the TV and/or also Turning the TV On by Turning On the PS4, is called HDMI Device Link.